Tomorow is the festive day of Raksha Bandhan, a festival celebrated by every Hindu all over the world, and which falls on the full moon of the Shravan month of the Hindu lunisolar calendar. On this day, me and my baby brother ( Yash Krish ) celebrate our relationship as a brother and sister. We have always been very very close and we love each others company. Every year it would be my mum that makes something special for raksha bandhan but this time, I thought that I would give the cooking a go and make whatever my brother wanted. I asked him what he liked and he replied "biscuits". So, instead of making him plain biscuits, I looked up a recipe for biscotti. I came across mango biscotti - and as everyone in the house is a huge fanatic for all things mango - I simply couldn't resist giving it a go. You can look at my mum's other mango dishes in the MANGO MANIA section !! 1.5 cup kesar mango pulp you can use Alphonso too or maybe fresh pulp from any ripe mangoes. Mix plain flour, corn meal, baking powder, soda and cardamom powder in a one bowl and leave aside. In another bowl combine mango pulp, oil, sugar and vanilla extract and whisk for 2-3 minutes or until sugar dissolves. Now add the flour mix in a 3-4 batches and do not whisk more than 20 seconds each time. Mix everything evenly. Leave the batter for 5-7 minutes, at this stage batter will be very sticky and thick. Line a baking sheet with parchment paper, divide the batter into four equal parts and place on a flour surfaced board. Now pat each half batter and shape them into a log around 10 inch long , 1 inch thick and 3-4 inch wide. Place on a baking tray and bake 35-40 minutes until firmed. Cool about 10 minutes on a wire rack, then place them onto chopping board and cut biscotti into a thin slice using serrated knife. Place the cut biscotti on a baking tray again and bake them about 15-20 minutes or till lightly brown. Remove them from the oven and let it cool on a wire rack. Can be store up to 2 weeks in loosely in air tight container. 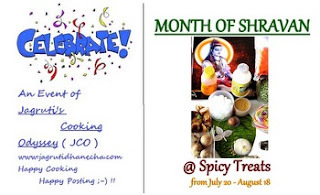 Linking this to JCO's current event Rakhi - The thread of Love , Celebrate - Month of Shravna guest host by Sangeetha, event owned by JCO and Celebrate - Monsoon of India guest host by Sayantani, event owned by JCO. Also to Archana's WTML guest event, own by Gayatri. 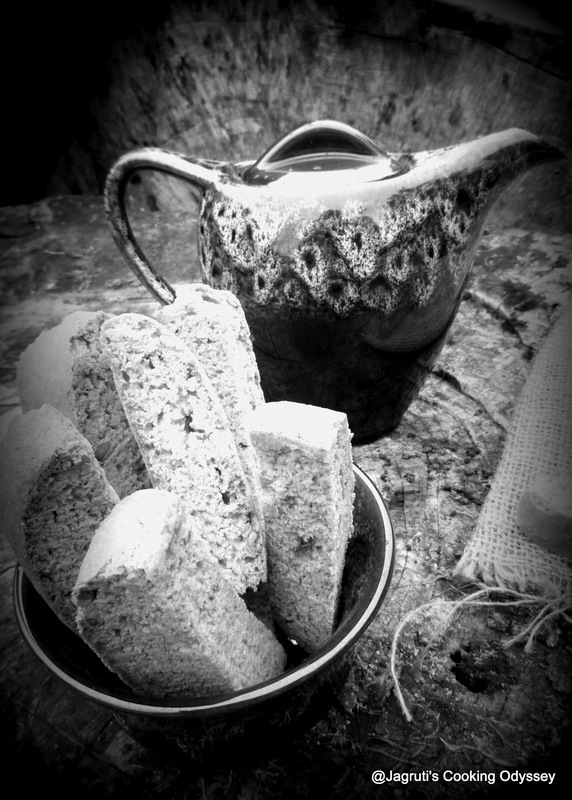 Wow lovely post hayley.Biscotti look awesome.Love the props in the photos too. AWESOME!! !Dear Heyley you have done these Biscotti so perfectly...I will surely love to try these soon ..clicks are so wow!! Awesome recipe! Love mango flavored biscottis!! Delicious and wonderfully flavored biscottis. I love Biscotti but haven't made my own. I need to try this recipe! I love mango everything, but never thought of using it in a biscotti. Will have to make! I love biscotti! I've got to try yours! Love biscotti and I think these mango biscotti would be something very special. Good celebration cookie. Mango biscotti! This is genious!!! YUM! Haha, I hope your brother gives you a special gift because these are gorgeous! It looks like you had a lovely celebration and I hope your brother got you a nice gift. Mango biscotti sound wonderful. They are so great with a bit of coffee or tea. What a great idea to make a mango biscotti! I love anything mango too and really miss not having them easily available. Enjoy the holiday! I too am a mango fanatic and love kesar and alphonso varieties which we can readily find imported to UK. I have never seen mango biscotti before, love the idea.